I recently saw a post about some of the great apps that have been developed using smart phones and tablets to take pictures of peoples whiteboards. Some are very cool. So check out Capture at www.ebeamrocks.com today and see what you can do. If you haven't seen this yet you should check it out. Whether you are using eBeam for Education or Business the Home screen provides a unique ability to help you organize your stuff. Organize them as they make sense to you and your needs. eBeam Home is available on Edge through a menu feature. On Engage there is a eBeam Home button that allows you to bring it up almost instantaneously. Check it out - we will have a video on our site soon going through how to use it. 1. It's Portable- It can turn any standard whiteboard, or other flat surface, into an interactive space. 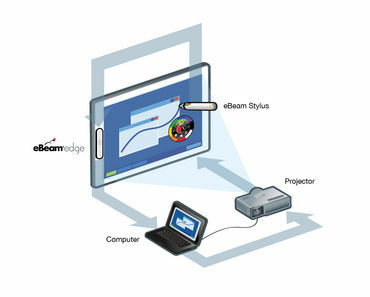 Only the eBeam Edge, a projector, computer, and the supplied USB cable are needed (Wireless version is also available) to use it absolutely anywhere. 2. It's Small- The eBeam Edge measures less than 8 inches long, and weighs less than 4 ounces. The stylus is smaller than a regular whiteboard marker. It can easily fit into purses and laptop bags, or even in a pocket, if you're on the run. 3. 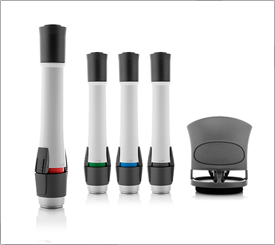 It's Easy to Install- Installation and calibration take only a few minutes and no special tools are needed. 4. It's Easy to Use- The stylus, when used with the cute but effective tools palette, allows the user to manipulate the device with simple taps of the stylus. With the palette, the user can control the stylus as the mouse, as well as highlight, draw, and annotate on the capture area. It is user-friendly for all ages, and also for all levels of technological savvy. 5. It Promotes Sharing- The presentations created with the eBeam Edge can be shared directly with a classroom of students or a conference room of employees, and can be shared in real time on local networks or over the Internet. Then, all of the presented information can be saved for future use, or emailed to the participants for review. 6. Its WOW Factor- I use this in my home office, and every time I show it to a guest in my home, it blows them away. Professionally, eBeamRocks! has done demonstrations to many different people-- ranging from kindergarten teachers, principals, and department heads to CEOs, IT Directors, and national sales trainers-- and we always get the same response- "Wow!" It really is a cool product with a ton of great features that help in teaching, training, brainstorming, planning, and more! 7. Its Low Price Tag- This is a great value! It gives you the functionality of a smart board at a fraction of the cost. "Interactive" or "smart" boards can cost up to $2,500 and of course, need to be mounted in a permanent location. eBeam Edge Projection starts under $650 and can be moved quickly and easily to suit your needs. eBeam Engage is the big brother to Edge. It is about 34" long and about 2" wide. It is packed with lots of features that make it a fantastic tool for teachers, trainers and anyone that spends time in front of a class or audience. There are a few others as well. Enjoy the video - let us know what you think.